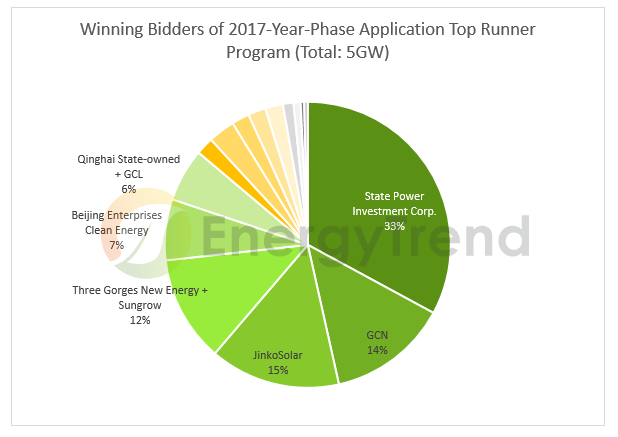 The 2017-year-phase Application Top Runner Program's auction were completed. According to EnergyTrend's compilation of the bidding results, mono-Si took the most shares, and bifacial technology occupied more than 50%. The bifacial technology will accelerate its commercialization process because of the Application Top Runner Program. Meanwhile, the total percentage of successful bidding projects by state-owned enterprises amounted to above 80%. The state-owned companies are apparently leading the technology advancement. In the Application Top Runner Program of 2017, there were quite a number of consortiums. According to these consortiums' stock composition, the successful bidders are listed in the pie chart below. (Note: Each of the following two consortiums was awarded jointly within its two companies. 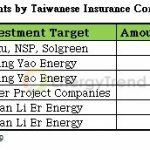 Therefore, bids won by these two consortiums were not listed separately: China Three Gorges New Energy Co., Ltd. plus Sungrow Power Supply Co., Ltd., and Qinghai State-owned Assets Investment & Management Co., Ltd. plus Golden Concord Group Limited. (GCL)). State-owned companies that are not consortiums won a total of 52% of the bidding projects. They are State Power Investment Corporation, China General Nuclear Power Group (CGN), Beijing Enterprises Clean Energy Group Limited, and China Energy Conservation Investment Corporation (CECIC). Besides, state-owned enterprises that are involved in consortiums took more than 80% of the bidding projects. The projects that were completely won by private enterprises were only 400 MW, less than 10%. These companies are JinkoSolar, Tongwei and Chint. In addition, according to National Energy Administration's document "NEA's notice about 2017-Year-Phase Top Runner Program’s Bases" that was issued on December 29, 2017, the three Application Top Runners whose bidding prices are the three lowest compared with the FiT electricity price would be rewarded the matching scale of construction bonus. These three bases are Hebei's Haixing, Qinghai's Golmud and Qinghai's Delingha. These bid winners are either a state-owned company or a consortium including a state-owned company. In this round of bidding projects, there were quite a lot of projects containing 2 or 3 products. For now, each product's real share in a project is not comprehensively specified. The pie chart below showed estimated portions according to technology maturity for each product. There are some technology highlights in the bidding results. 1. The total share of mono-si (including P-type and N-type) reached 86%, and its total wattage came to 4.3GW. Mono-si is still dominating the Top Runner Program. 2. All P-type mono-si modules adopt PERC. In addition, every 60-cell module's wattage reached 310W, the upper limit in the scoring system. 3. More than 50% of P-type mono-si is predicted to use bifacial technology. 4. Surprisingly, N-type appeared in the Application Top Runner Program. In the projects that are surely using N-type technology, more than 90% of them will use bifacial technology. As for projects that have not decided to use N-type or P-type mono-si PERC, they are expected to use bifacial technology. 5. Winning bidding projects of bifacial products is estimated to reach 2.5GW. 6. 50% of P-type multi-si uses MWT, and the other 50% uses PERC. MWT is one of the options that multi-si technology can raise its wattage feature. Among the winning bidders, there are add-up technologies, such as the shingled and half-cut types. However, they did not draw attention as much as bifacial did. 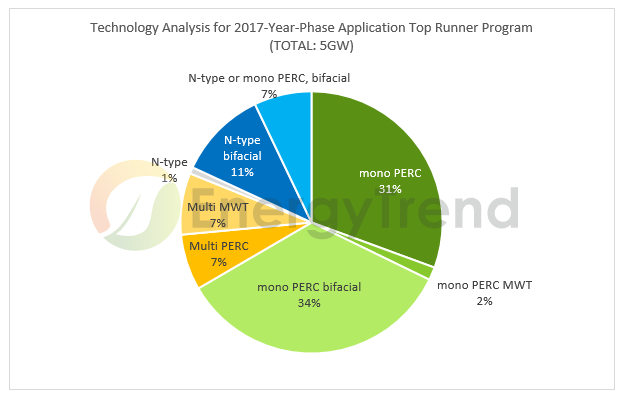 The demand from Top Runner Program to bifacial technology will directly improve the development of mono PERC and N-PERT technologies. Whether the production output of polysilicon for mono-use be sufficient will be the major issue in PV supply chain this year due to the bidding results, following the price and market share competition between mono-si and multi-si in 2018. According to "NEA's notice about 2017-Year-Phase Top Runner Program List and Implementation of Requirement " (released on November 30, 2017), Application Top Runners of 2017 should get their power plants connected to the grid by the end of 2018. However, for the 1.5 GW bonus, the deadline of getting connected did not get specified. Its deadline is expected to be the same as that of 5GW. However, some 2017-year Application Top Runner projects' connection to the grid might be delayed to the year 2019 for the following two reasons. 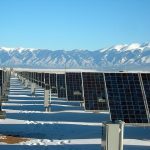 First, according to the "About Opinions to Properly Manage PV Constructions" released in April 2018, under some special conditions, the Top Runner projects will be allowed to be postponed constructing from the year 2018. Second, at the end of 2018, installation rush is expected to happen.